I just noticed, on my post editing interface I can insert photographs from Flickr.com — this is not a function on wordpress.com, so it is probably connected with a plugin I installed a long time ago and recently upgraded. 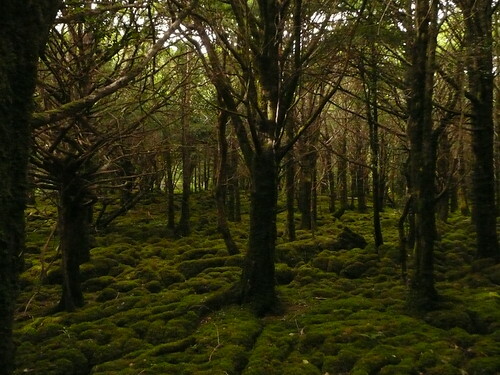 This is a photo of a stand of yew trees in one of the only ancient yew forests left in Europe. It is located within Killarney National Park and is one of the places I insisted on visiting. The magic you feel while surrounded by gnarled yews on mossy hills is very strong. Even folks who don’t believe in fairies come away with a little more understanding of the folks who do. This is so incredibly beautiful. BTW, what do you mean “folks who don’t believe in fairies”? Doesn’t everyone believe in fairies? wow. i’ve never been to that part of killarney. that’s beautiful and wild and mysterious. and yes, absolutely, fairy-filled!